It is much often that we destine the wooden scraps to landfills! Do you really think that this is a better way to deal with them? 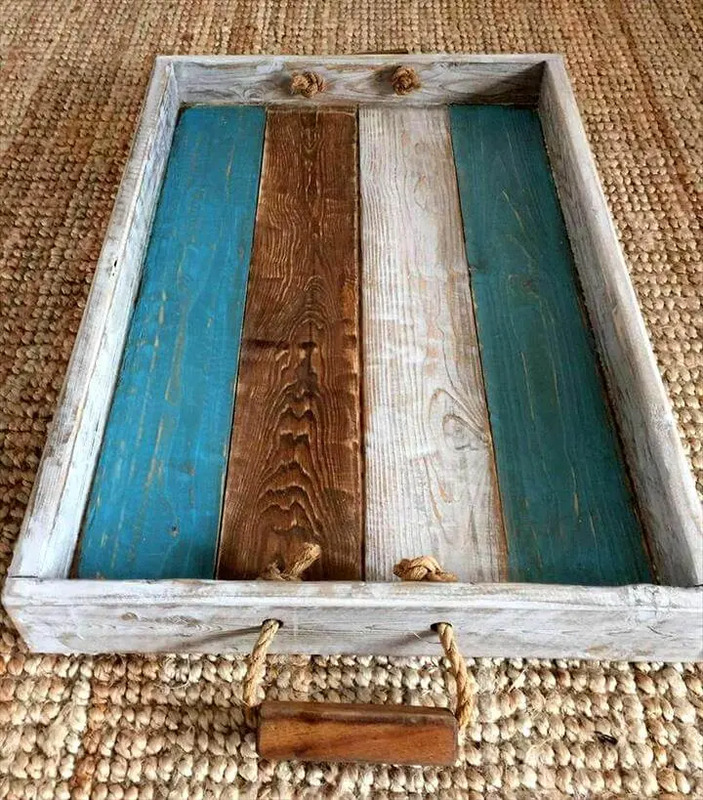 Not actually, as there are many serviceable roles waiting for the wooden scraps just like this DIY shabby chic wooden pallet serving tray with nautical rope handles, made of scrapped away pallet slats painted differently but final design comes with a dominance of white color! 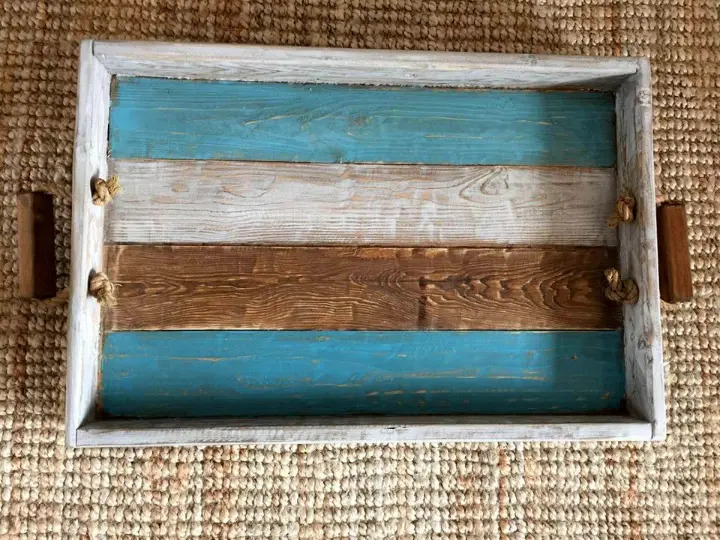 For a glam shabby chic appeal, the gorgeous brown and blue paint shades have also been made a part of the final avatar of the tray and finally have been distressed also a little! 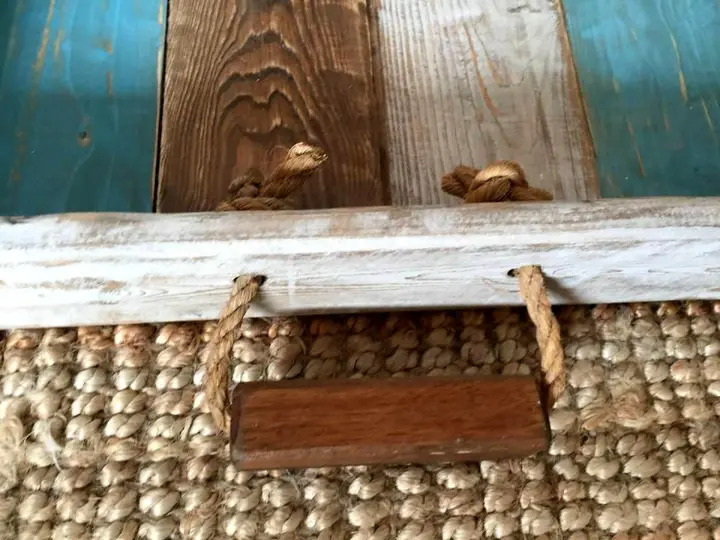 This wooden tray has been made super easy to live up due to the installation of side nautical rope handles, wooden ends have been knotted from inside of the tray for an ultimate grip! This tray would really be special to use as a breakfast tray, as a dining table spice jar organizer and would also be great to hold the cutlery items! This custom wooden tray is the simplest ever project here to do with pallets! Just put a few of pallet slats flat and install short boundary around to get a perfect tray! This process is all you can repeat for amazing crates, pet beds and also for storage boxes out of pallets! 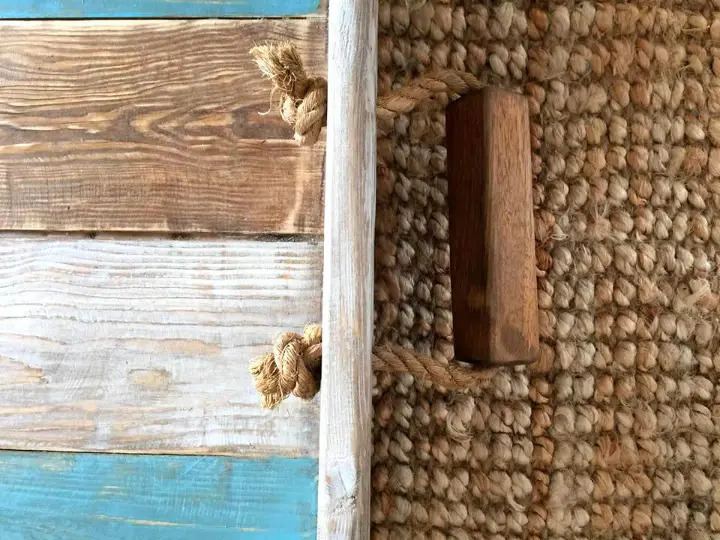 Tiny holes have been made in the sides through which the rope ends have been passed and knotted on opposite side for amazing rope handles that will help to life the tray conveniently! The rope loops have been given additional wooden handles for tight grip and this also raises the aesthetic value of entire layout of tray! Get a few of pallet remains if need to copy this tray! Distressed but final colorful appeal has been given to this tray using white, brown and white colors! This creates a shabby chic and nautical avatar of the tray!